LTS offers a wide range of Engineering Services for all aspects of High Pressure piping design, and equipment supply. This includes Conceptual Designs, FEED studies, Proof Testing as well as undertaking Research and Development Programs. LTS offers 3D Solid Modeling capabilities for a variety of High Pressure piping, valves and flowline components, fully meeting ASME, API and ANSI design codes. 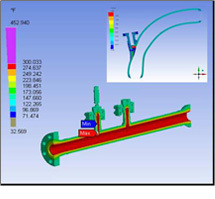 In addition, can undertake R&D Studies including Finite Element Analysis and Prototype testing in accordance to specific customer needs and applicable code requirements. 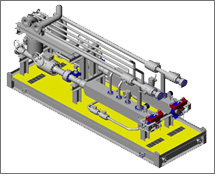 LTS designs and builds High Pressure flowlines, offered in either “Fabricated” or “Building Block” style. In addition, provides assistance in material selection and equipment sizing. Each flowline can be tested and painted prior to shipping, or supplied in component form to be shipped anywhere in the world. External loading and design calculations are available as well as full design reports supplied for Third Party review.requirements. Basic Design and FEED Studies LTS offers comprehensive design and product knowledge which allows for quick and accurate FEED studies performed at the earliest stage of any project. These include skid template and component sizing, bill of materials list, cost and delivery estimates, and recommend manufacturers.